In early 2006 I contacted Dave Burket (owner of Model King) and showed him some of my design, illustration and model building skills and we struck up a deal for me to do some model kit box art projects for him. Below is the first in a series of projects I've completed for him. Growing up as a kid I remember being inspired by all the great artwork the model companies used to print on their boxes. During the '60's and '70's they employed several great illustrators to paint portraits of the cars. Often the artists would capture a car at a heightened moment in some thrilling scene; Drag cars, wheels up and tire smoking. Stock cars spinning out. Sports cars blasting through darkened woods in the rain. They were very dramatic and the only thing missing was the roar of the engines. They really got me excited about building the kit. The down side of course was that occasionally the model inside never quite lived up to the expectations set by the artwork. Anybody who has ever opened up a Palmer kit will testify to this. So as consumers started to demand a more accurate representation of what was actually in the box, the time consuming task of creating the paintings got replaced with simply building the model and photographing it. While I understand the economics if it, I think a lot of the emotion appeal of those vintage boxes got left behind and by the price I've seen empty boxes sell for - collectors must agree with me. I've always thought it would be fun to build the models that get used for the photography on model boxes, but I wanted to take it a bit further and combine that with my other design, illustration and photography skills to create a more complete piece of art. After discussing my vision for the boxes with Dave I realized our tastes were very similar and I thought this would be a great opportunity. For these kits I would design the paint schemes, create art for the decals, build the model, and do the photography. I would also create illustrations & graphics for the box tops done in the nostalgic style that I was so inspired by as a kid. For the most part Dave has given me free rain to go wild. So, rather than having a same "corporate brand" look to the boxes repeated over and over again, each one will be unique all to itself. My goal for these boxes are to make them every bit as collectible as the kits inside. 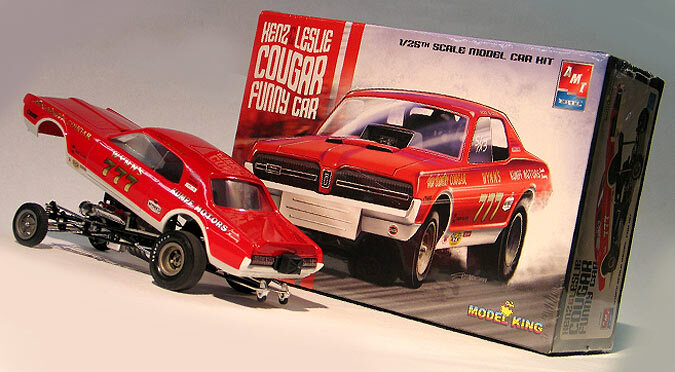 The first in the series is a reissue of the MPC '68 Cougar funny car kit. This kit was released several times back in the late sixties with replica graphics of several different drivers but never as a replica of the Kenz & Leslie car. 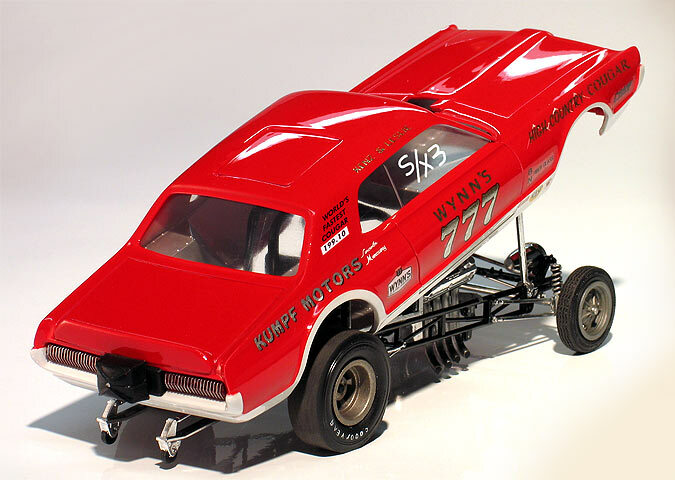 Dave secured an agreement with driver Ron Leslie and his car will finally be replicated in 1/25 scale. Ron Leslie is a very nice guy and I talked with him several times by phone and email. He was able to provide me with detail information to make the car as accurate as possible. He also gave me a lot of vintage photographs that were a great help. Some of those ended up in the box art. 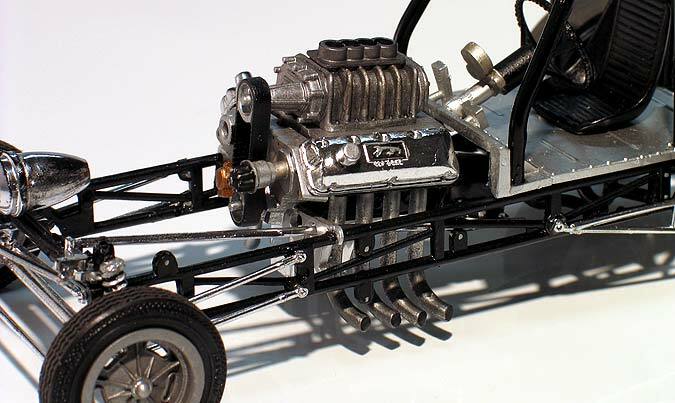 One of the challenges here was to replicate the original car as closely as possible while still being built "out of the box". It would have been easy to build the car more realistically but it wouldn't be fair to the buyers of the kit to see the model pictured on the box and then find it didn't come with those parts in the box. So, I stuck with just using paint and decals to get it as close as possible. 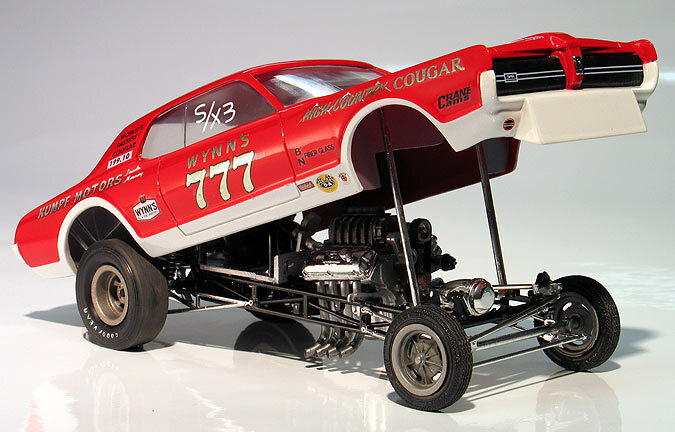 Luckily, the kit is pretty close to how Ron raced his car in '68. The most notable absence being the Cougar GT-E hood scoop and trim. It was not economically feasible to modify the tooling so there wasn't anything I could do about the hood scoop but I did add the GT-E grill trim to the decal sheet. This will leave room for the builders who want to super detail their version. As far as putting the box art model together, it is a very nice kit with a really good looking chassis once put together. One note to builders, I moved the rear axle backward slightly in order to center the wheels in the wheel opening. If you are building this kit, do some test fitting here. I also molded the front and rear bumpers and grill to the body to fit better before painting. I also sanded the rear edge of the front air dam flat to match the real car better. I figured these mods weren't beyond the skills of most modelers and did stay within the confines of using the kit parts. It's hard to tell from the photographs but Ron Leslie told me the real car was painted pearl white along the bottom of the body. I shot the body with Tamiya pearl white and then covered the top portion with their bright red paint. Kevin Ellis from www.badhabitmotorsports.com created artwork for the decals and made several sets of prototype decals for me. After applying the decals I shot the body with PPG concept 2000 urethane clear. Because I built my model from a test shot there was also no chrome plating, so I painted all the chrome parts with Alclad Chrome over a gloss black base coat. Don't worry, the real kit comes with the chrome parts already plated. For the box itself, I wanted it to have an very vintage feel and look as if it had actually been printed thirty years ago. The photography was slightly yellowed to amplify this effect. 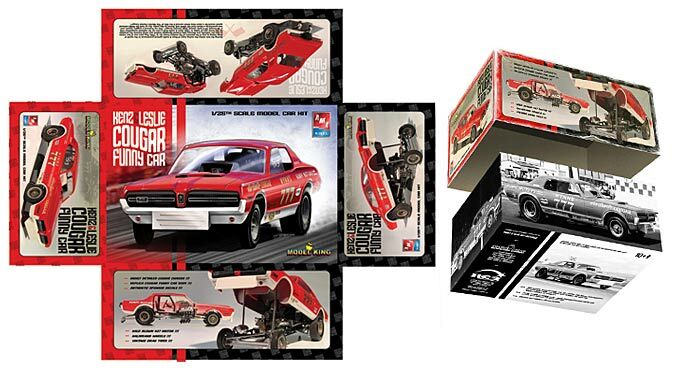 The box also features an illustration I did of the car burning down the drag strip at speed. I "painted" the illustration digitally on a Cinteq tablet (a computer monitor which allows me to draw right on the screen) using a combination of Coral Painter IX and Photoshop CS2 software. Typically, the bottom of the box gets ignored but I wanted to do something special here. Because the manufacturer was printing the bottom box anyway I thought I might as well make use of it and add some extra value to the kit. I used the vintage photos Ron sent me and put them on every side. It was an easy way to add some reference photos for building the model and gives the buyer an extra surprise when they open the kit. I really enjoyed working on this project and was very pleased with how it turned out. My greatest joy has come from reading the kind words that Dave Burket, Ron Leslie and several other modelers have wrote to me. One poster on a message board mentioned,"it's like buying the box and getting a kit for free" and to me this was the greatest compliment of all. 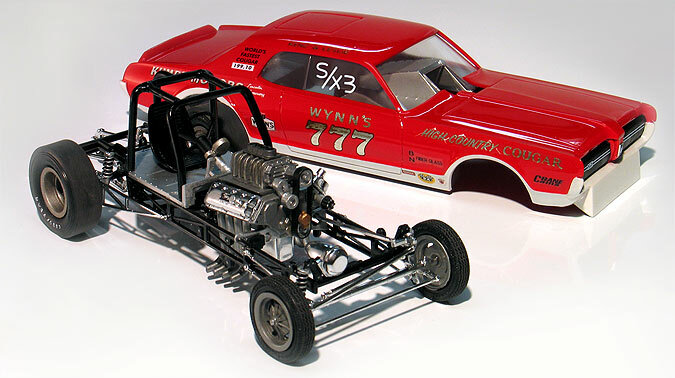 See other model kit packaging and decals I've designed.